There's just something about a-england that instantly puts a smile on my face! When I learned that Holy Grail was being discontinued, I must confess that it felt like a shock but of course, knowing Adina, she had something up her sleeve and replacing it by a new and re-vamped version somehow seemed evident. So here it is, along with Beauty Never Fails, also new and exclusive. 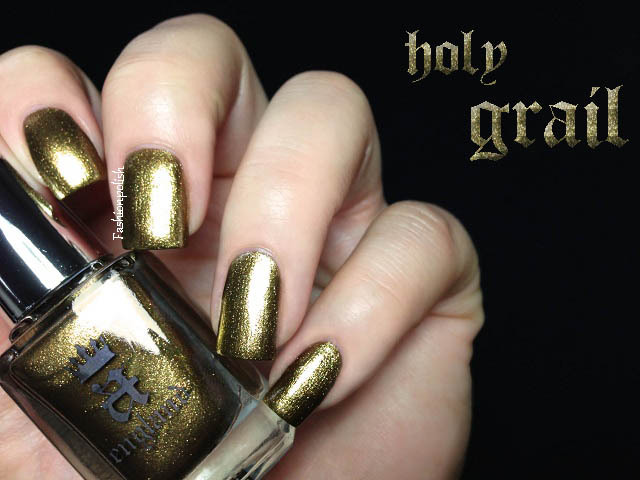 Holy Grail is a complex antique gold shimmer with an innumerable amount of gold, bronze and green particles. 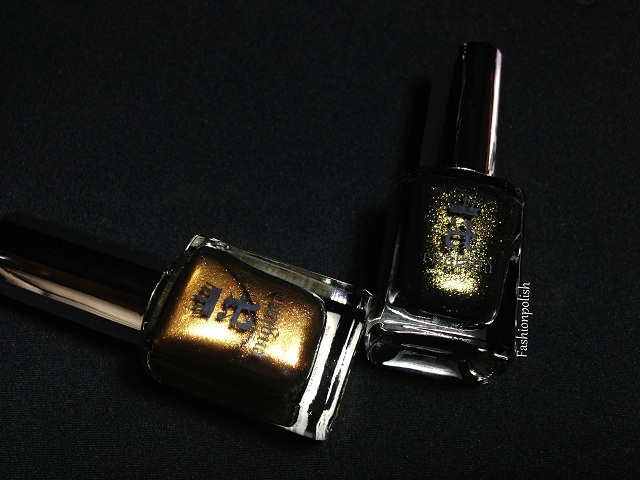 The first stroke of polish, if not the shade in the bottle itself, truly sets it apart from the original version, first because of its heavy and sumptuous hue but also because of its extraordinary pigmentation. Depending on the lighting, it will appear either warm, almost coppery to completely cool and almost greenish. I used 2 coats here, combined with The Knight (basecoat) and The Shield (topcoat). 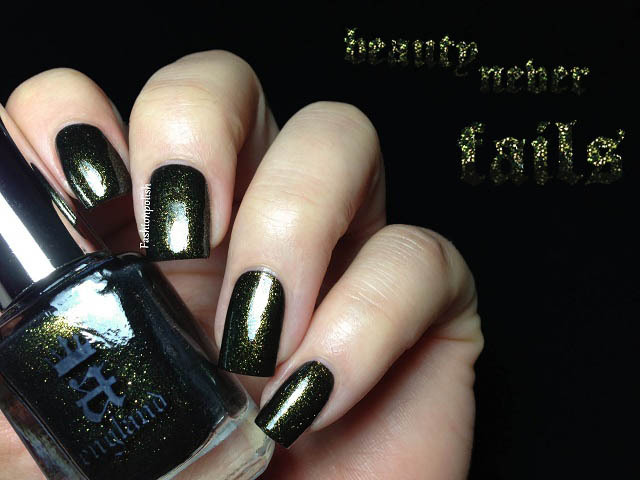 Beauty Never Fails is a heavy mix of coarse gold, copper and green shimmer in a blackened base. 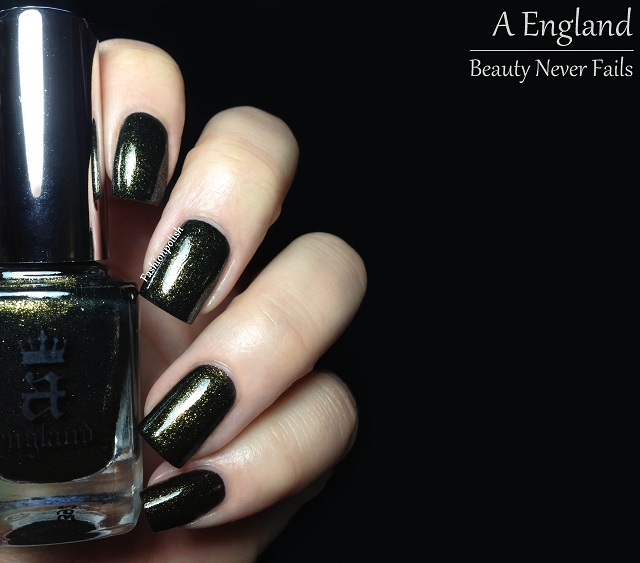 Vampy as vampy can be, definitely my favorite kind of shade and a must have for every a-england lover. 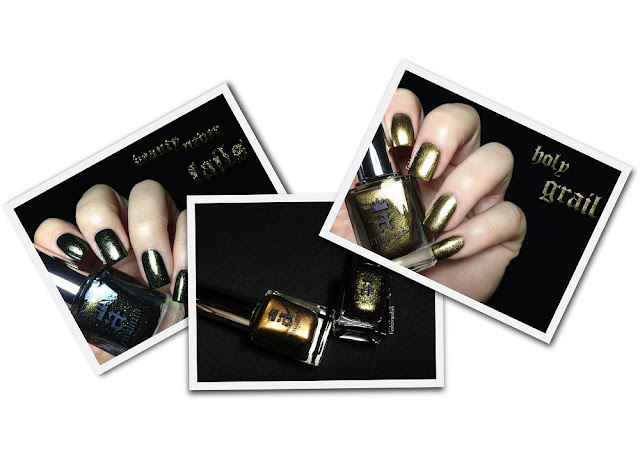 If you've been holding of the Gothic Beauties because they looked too black for you then you will love Beauty Never Fails as it differs from black even under low lighting. Formula was once again pure perfection and barely required a second coat for complete coverage. Again, this is 2 coats with The Knight and The Shield. I couldn't express just how much I love both of these shades. I have no idea how Adina manages to surprise us each and every time with such stunners and yet she does. Always. Holy Grail and Beauty Never Fails retail for £9 each and are available for sale through email order and very soon on a-england.co.uk. For more information, please refer to a-england.co.uk or a-england on Twitter/Facebook. Read the post and immediately shot off an email to Adina, asking if I could order Beauty Never Fails. Great shots, great review. Thanks much. Just ordered these from Adina on Thursday. I cannot wait to have these in my hot little hands! Your swatches are breath-taking, as always. If I had been on the fence about these, this post would have certainly pushed me over the edge! So glad I call them mine too :-)!!!! Your swatches are plain awesomeness!!! The new holy grail is exceptional! Way better than the original. Beauty Never Fails is so stunning gahh! I want! AHHHH stop making everything look so gorgeous Sam or I'll go bankrupt ;)!! !